Sound Connections is pleased to announce that ‘ReWired’ youth voice spotlighting survey has officially been launched. 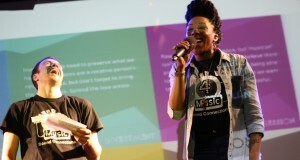 This survey forms the beginnings of the national youth voice research project focusing on spotlighting youth music leadership in England. This research will aim to shine a light on existing models of youth music participation and organisations hosting youth music projects with a view to gaining a greater understanding and awareness of the landscape of young music leadership across the country. We hope to encompass all regions and the full diversity of music organisations working with young people, so that together we can support more young people to experience music in ways that best meet their needs and desires. This survey aims to gather information from participants regarding the youth participation work that happens within their organisation. This information will then be used to write an interim report and create an interactive map. We will share this information amongst participants and identify three case studies to explore in detail and showcase. This will culminate in a national summit for all attendees to discuss the potential for a National Youth Music Council. If you would like to be a part of this research then please complete this short survey. Additionally, if you know of any other organisations that you think would be interested in taking part in this research then don’t hesitate to get in touch.